Why use better HDMI cables? It’s very difficult to understand the problem. It’s related to all the HDMI components in the system, not just one. It’s also a result of a HDMI specification flaw. It will happen to certain systems no matter how well each component is designed and built. One-way data transmission using one wire. The transmitter pulls the data line either to high (+5 V or logical "1") or low (0 V or logical "0"); both stages are stable. Two-way data transmission using two wires. Two wires, one for transmitting (Tx) and one for receiving (Rx). True duplex and highly reliable. This one wire for two-way communication protocol is called I2C (read as eye square see). I2C stands for Inter Integrated Circuit, developed by Philips to enable two-way communication between IC chips on the same circuit board. Later Apple used I2C in their MAC computer to connect LCD monitor to the main unit; it became the DVI standard. 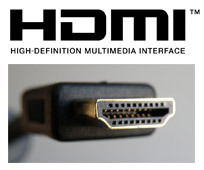 HDMI inherited the I2C from DVI for backwards compatibility. In addition to the high and low stages like in the one- way communication, I2C also enables a 3rd stage called floating; in this stage the wire is neither pulled high or low. Multiple devices share the same wire; the device pulls the wire to high or low would become the master; the rest of the devices become the slaves. When the master finishes talking, it releases the wire to floating so other device can become new master. This I2C protocol works well within a circuit board, and between MAC monitor and computer because the distance of ICs are very close and all components are designed by the same manufacturer. When we use it in an HDMI system in which the cables are long and many devices are made by different manufacturer, problems happen. When one device starts talking, it pulls the wire high or low; but it takes some micro seconds to charge the capacitance in the cables and the devices on the line; so there’s a chance that other device is checking the wire and determined it’s free and starts talking at the same time; this is collision! In many cases, it’s not the individual device to blame for the collision; rather it’s the HDMI spec flaw. The collision depends on the combination of all the components in a system; It will happen, but we can not predict to which system. It’s like throwing a dart onto a board; the collision only happens when the dart hits the bull’s eye. Refers to how many pixels in horizontal and vertical direction per frame. 720p has a resolution of 1280x720, while both the 1080i and 1080p are 1920x1080. Refers to how many frames or fields of pictures per second. The common rates are 30 and 60 Hz in the US, or 25 and 50 Hz in Europe. The film uses 24 Hz. Refers to how many bits of data needed to encode each pixel. Common ones are 24, 30, 36 and 48 bits. Data rate = (Total number of horizontal pixels) x (Total number of vertical pixels) x (Refresh rate) x (Bit depth) x 1.1 (to 10% more for Audio and Auxiliary data) You don’t have to memorize the formula; all you need to know is that when the resolution doubles, the data rate also doubles. When the refresh rate doubles, the data rate doubles also. Further, when the bit depth doubles, the data rate also doubles. Data rate is the single most important spec for the cables; it affects how far a cable can carry a given signal format. this is a new resolution added by HDMI 1.4; it’s the short description of the 3840 x 2160 resolution; which equivalent to four 1080p images. To prevent the data rate being too high, the HDMI 1.4 limits the refresh rate of this format to 30 Hz (or 25 Hz in EU and Asia, 24 Hz for film) or half of the regular 1080p; thus the data rate is only twice of the 1080p. But 30 Hz is a trade of moving image quality. To take advantage of the new HDMI 1.4 features, every one of the electronics device in a system needs to be HDMI 1.4 compliant. If any of them is not HDMI 1.4 compliant, the whole system down grade to the common signal format all devices are compatible with; this is called backwards compatible. These products do not participate in the initial handshaking (communication) to determine the system compatibility; so they can not ask the system to downgrade if they are not HDMI 1.4 compatible. For passive cables, the 4k x 2k and 3D formats would double the signal data rate thus would reduce the max length they can transmit by half. You may see many systems which worked just fine before all of a sudden go dark after device upgrade or a new movie is inserted. It’s always a good idea to buy cables with more headroom. For the pass thru electronics, if the max data rate they can handle is less than the new 4k x 2k or 3D required, the signal won’t pass them regardless of the cable length. The edge of technologies is constantly moving forward and won’t stop. Because if it’s not, the prices of the high tech products would keep falling to pennies based on the Moore’s law. Manufacturers have to come out a new technology every 2 years or 3 to boost the prices of the products to counter the Moore’s law. So instead of complaining about the new technologies, let’s embrace them, learn them and enjoy them.